My three stars is not bad. It’s also not negative in any way. I want to put that out there first. I am just slightly torn on how to compartmentalize some of the things that happened in this book. I’m torn on how to feel about those things. We all read books differently and we all have “quirks”. I also realize I will probably be the only three-star review with this book so I hope once people read this they see that it’s not a bad thing. The book overall was a great read filled with smooth flowing writing and a great story line. While I believe that Ella handled this subject with sensitivity, she romanticized it. And that’s a huge pet peeve for me. I don’t like for any of my books to be romanticized by mental illness. There’s a way to write and execute it (Six Feet Under by Whitney Barbetti & Some Sort of Happy by Melanie Harlow are two of my favorites) and there is a way to put it into a book for the sake of the romance and dramatic effect, which is what happened in Bittersweet Always. With me saying that- it’s not a bad thing. I don’t think it is at all. I mean, authors have to write about something and some choose this but I just had a hard time rooting for Toby and Pippa. Which leads me to my next point. I loved Toby and Pippa. But I did not love them together. They were not the type of toxic that I typically enjoy (that’s weird to say, right?) Their characters were such strong characters until you put them in a scene together. And this was partially because a lot of the first half of the book was really rushed. The pacing was off for me. I didn’t get the time I needed with Toby and Pippa, together, they just sort of…happened. WAM, A COUPLE. There was also a part in this book that I won’t name that Toby’s POV was very necessary but for a few chapters we actually don’t see it. In this particular circumstance- I felt it was needed more than Pippa’s was. I think it would have helped me really connect with Toby. However, I devoured Ella’s writing and the internal dialogue that is Pippa. She was quite a fun character who had a lot of potential and depth. I loved the incorporation of Daisy and Quinn as well considering I loved Suddenly Forbidden. So, it was nice to be back with some people that we are all familiar with. 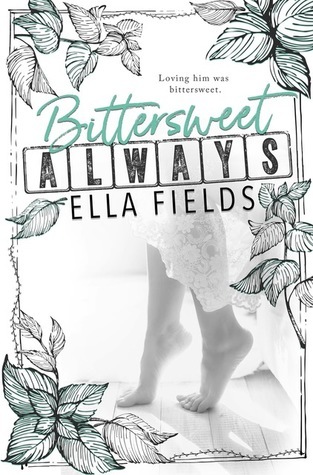 I think if you’re looking for a book that romanticizes mental illness, one that isn’t so “dark” and overwhelming- Bittersweet Always is for you. I particularly like the ones that are deeper and more emotional when it comes to mental illness, but with me saying that I didn’t hate this book and I didn’t love it. I liked it. I enjoyed the story-line and I enjoyed the banter and writing.